YOUNGSTOWN, Ohio — Ahjah Johnson was 17 when she started college. It was her first year away from home and her first taste of real independence, as well as the challenges that come with it. “I don’t think I actually cooked meals until I had my first apartment, and that’s actually scary because how do I know if the chicken is actually done? But I had to figure it out,” Johnson said. Now graduated, Johnson is program coordinator at the Office of Housing and Residence Life at Youngstown State University. The Arkansas native said she appreciates the support she received from her family, mentors and some older friends in transitioning to taking on more responsibilities – responsibilities that increased from undergraduate to graduate to a full-time employee. “The difference between then and now is I have all the bills in my name and I am completely financially responsible for myself and any incidentals that occur,” Johnson said. 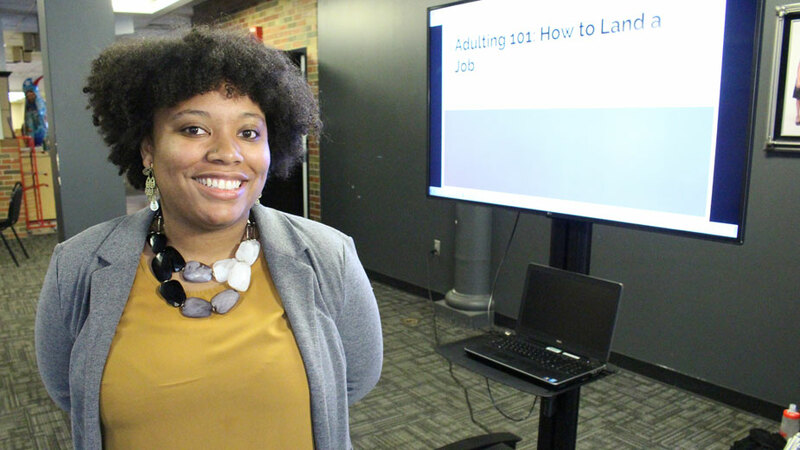 Ahjah Johnson, program coordinator at the Office of Housing and Residence Life at YSU, said Adulting 101 teaches students life skills as they take on more responsibilities. To help guide new college students through their own transitions, Johnson is instructing a few sessions of Adulting 101, a series presented by the Division of Student Experience that teaches students basic life skills that aren’t typically covered in the classroom. Adulting 101 sessions are held throughout the semester in collaboration with Student Activities, the Andrews Student Recreation and Wellness Center and the Office of Housing and Residence Life. Adulting is a slang term used to describe the day-to-day activities associated with being an adult, such as paying bills and doing laundry. Adulting 101 sessions cover topics ranging from cooking, budgeting and wellness to more employment-focused skills. This month, Johnson instructed the “How to Land a Job” session, during which seven YSU students learned about crafting an elevator pitch as well as asking and answering questions during a job interview. The students broke out into teams to practice what they had learned. Students like Michael Kelson, a freshman majoring in computer science, who joined the workshop with his friend. Kelson looks to apply for a job as a desk assistant at the YSU housing office and said the session helped ease his concerns about interviewing by giving him “various ways to tackle questions,” he said. Also at the session was Gabrielle Wagner, a sophomore majoring in the exercise science physical therapy track who is applying to be a resident assistant. The session made Wagner feel more comfortable with interviewing for a job, she said, particularly the face-to-face practicing portion, which will help her with the RA position that can involve being active on campus and communicating with others. More information about the Adulting 101 sessions is available on the Student Experience Spring 2019 Calendar, as well as the event lists on the YSU mobile app. Pictured above: Ahjah Johnson teaches the “How to Land a Job” session of Adulting 101 at YSU.